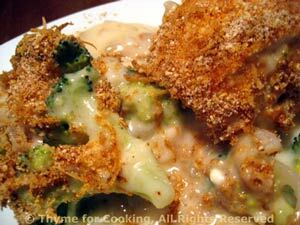 Chicken Divan, easy gourmet dinner recipes. One last dinner from the oven (except for quiche); one last head of broccoli; transition cooking is slowly ending. New potatoes are very young potatoes, golf ball size or smaller. Roast them whole unless quite large. Fingerling potatoes would be a good substitute. Actual new potatoes do not keep well and should be used within a few days. Leave small (an inch (2.5cm) or less in diameter) new potatoes whole. Cut larger ones in half. If using regular potatoes cut into quarters or smaller. Put potatoes in a bowl with olive oil and stir to coat. Lay on a baking sheet and roast, 400F (200C) for 30 minutes. Mince garlic and snip parsley. Melt the butter in a skillet large enough to easily hold the potatoes. 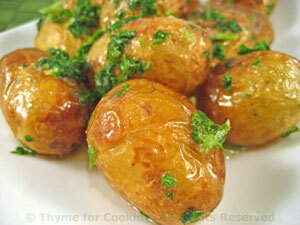 Add the parsley, potatoes and sauté 1 - 2 minutes. Remove, add some fresh pepper to taste and serve.